The two AmazonBasics Powerbanks served me quite well, but I recently replaced them with two Anker Powerbanks for two reasons: capacity (more) and size (less). Go and check my iPhone photography gear page for more info or jump directly to the Anker PowerCore II Slim 10.000 mAh power bank review. Moreover, Amazon recently sent out an eMail, asking buyers to stop using six models of the AmazonBasics power banks over fire concerns. Those two are among those six. When I still used a DSLR, I carried up to three spare (and charged) batteries with me. I remember when I stood at the North Cape in Norway and one battery after another would stop working because of the low temperatures. We had -5F. One battery pack allowed me to shoot 10-15 photos before it died because of the cold temperatures. In the early iPhone days, before I used my iPhone to photograph, I used battery cases to recharge my iPhone on the go for a full day of uninterrupted use. But for iPhone photography I found battery cases more annoying than helpful; e.g. I can't use iPhone accessories like tripod mounts, external lenses or flash lights with a battery case. I simply can't attach them to the iPhone with the thick battery case mounted. After trying different battery packs, I settled for three different battery packs with three different capacities. Two of them are from Amazon. 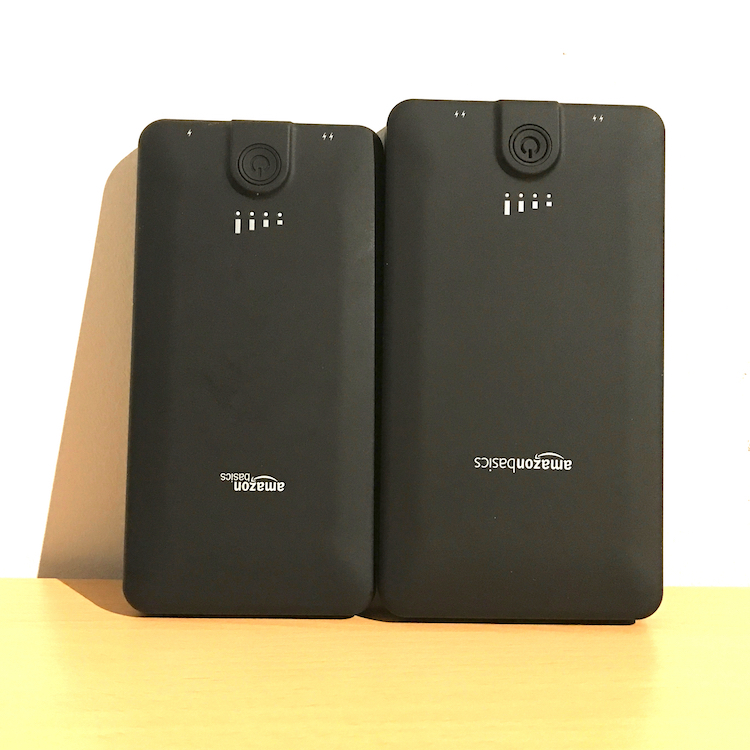 They are the AmazonBasics 10.000 mAh and 16.000 mAh battery packs. I'm quite picky about power banks. They have to be as small as possible, as thin as possible and offer things like power overload protection and status LEDs. With the 10.000 mAh version I can charge my iPhone 7 plus 3-4x depending on when I start to charge it (i.e., at 20% or at 5%) and if I use it during charing. The 16.000 mAh gives my iPhone 7 plus 7-8 charges. Both versions of the power banks come with two charging outlets. The 10.000 mAh version has two different ports. The one marked with one flash provides up to 1 amp, the one with the two flashes provides up to 2.4 amps of power. The new 16.000 mAh version also provides a total of 3.4 amps. But according to Amazon it seems that this is somehow dynamically determined. The maximum that one port can provide is 2.4 amps. You can basically charge both versions with almost any USB charger provided it does not provide more than 5V/2.4A. Both power banks have four blue LEDs to indicate the remaining charge and a power on button to start charging your iDevice. If the charge is lower than 10%, the last blue LED starts to flash. The 10.000 mAh version is 5.6 x 2.8 x 0.6 and weighs 7.58 oz. The 16.000 mAh version is slightly bigger and thicker and thus heavier at 5.9 x 3.2 x 0.8 and 12.2 oz. Well, those two power banks just work. I'm using the small one on a daily basis for almost a year now and charge it once every 4-5 days and I didn't notice any decrease in capacity so far. For 2+ day trips I'm using the 16.000 mAh version. At home I charge them and all of my other devices using the Satechi 7 port charging station [Amazon Link] and Anker Wall Charger [Amazon Link] on a trip. I recently switched to different power banks. I've listed them on my iPhone photo gear page.